A must see documentary for anyone who loves food and appreciates all the work and effort that goes into preparing an exceptional dish. 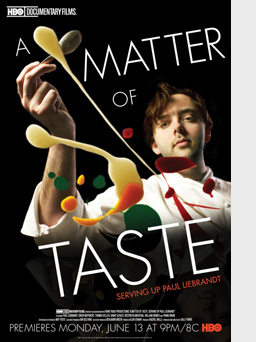 This is a classic story of a chef who comes to the United States in search of greatness and who pushes himself and all that works with him to be the best. The dishes one sees at the beginning of the film are works of art of a young chef. Of course with being so young and talented one gets the sense that his food is received as being arrogant and of trying to hard. I began to think of the great artists who probably had to endure the same criticism during their time to only be truly recognized for their greatness once their time had passed on this planet. For a bit I felt that this chef would face the same fate as he went from job to job. A fate of suffering. Years go by and I suffered as well even though this was mere minutes. Luckily through this time of suffering he continues to prepare for greatness waiting for an opportunity to appear and luckily that opportunity is embodied in Drew Nieporent of Nobu fame. A character that I only read about and saw on Anthony Bourdain’s shows carrying left over Toro for his chef friends to feast on into the late New York nights. Through this film I was able to see the passion and the experience of a true restaurateur who is there not to stifle the creativity of a chef but to provide him a platform to perform and excel. By the end of the film all I can is that I am truly happy for Paul Liebrandt. It is great to see someone who has worked so hard and sacrificed so much to receive the recognition he so truly deserves. This documentary is currently showing on HBO and can be viewed in its On Demand library. You are currently browsing the SimpleFoodie.com weblog archives for June, 2011.